Offer seed to birds while deterring squirrels using the Droll Yankees Sunflower Domed Cage and Squirrel Proof Feeder. 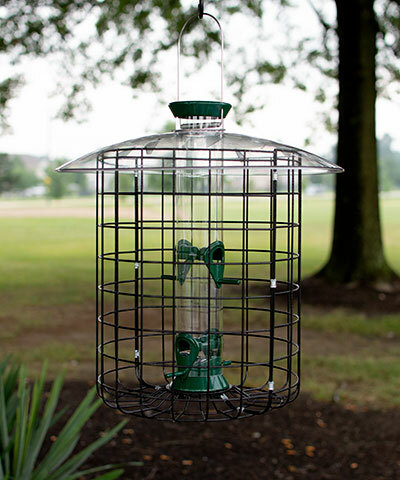 The caged design of this tube feeder resists squirrels, creating a haven for small songbirds. The 1.5" square fencing creates perching room for several birds, and the significant 3.75" gap between the cage and the feeder often prevents squirrels and larger birds from clinging onto the unit and stealing seed. These openings are also small enough for songbirds to fly through, reaching the four feeding ports with ease. A clear, 13.5" diameter plastic baffle tops the item, and the 13" tall tube easily accommodates 0.75 quarts of sunflower, mixed, or safflower seed. Each reinforced metal port has a perch, for birds to dine in comfort, and the green color of the cap, base, and ports adds a natural look. A threaded plug at the base allows the tube to fully remove from the cage for seasonal cleaning. Use the attached metal hanger to place this feeder in a tree or on a bracket, or use a 3/4" threaded adapter (not included) to pole mount the item. Deter squirrels from stealing seed using this Sunflower Domed Cage and Squirrel Proof Feeder. Lifetime warranty. Droll Yankees Sky Hook, Gray, 52"